In his revolutionary new book, Jan-Kåre Breivik profiles ten Norwegian Deaf people and their life stories within a translocal/transnational framework. Breivik notes that, unlike hearing people, who form their identities from familial roots and local senses of place, deaf individuals often find themselves distanced from their own families and akin to other deaf people in far locations. His study records emerging deaf identities, which he observes are always in the making, and if settled, only temporarily so. To capture the identification processes involved, he relies upon a narrative perspective to trace identity as temporarily produced through autobiographical accounts or capsule life stories. As a result, he has produced striking, in-depth accounts of how core questions of identity are approached from different deaf points of view. The ten stories in Deaf Identities in the Making reveal deaf people who would like a stronger link to the Deaf world. Each story sheds different light on the overriding, empowering master narrative that has become an integral feature of the Deaf community. Like success stories from other minorities, the Deaf life story reinforces the collective empowerment process in a Deaf social milieu. 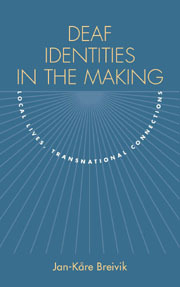 Because of these revelations, Breivik’s findings easily reverberate globally in conjunction to the striking similarities of deaf lives around the world, particularly those connected with the experiences of being translocal signers who have struggled for identity in an overwhelmingly hearing context. Jan-Kåre Breivik is a social anthropologist and researcher at Stein Rokkan Center for Social Studies at the University of Bergen in Norway.